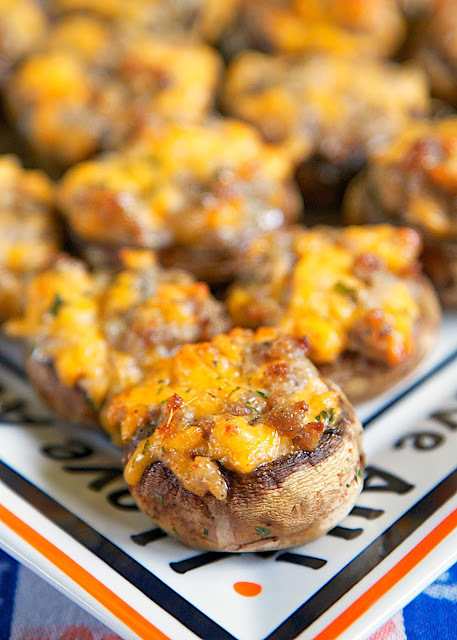 Sausage and Cheese Stuffed Mushrooms recipe - mushroom caps stuffed with sausage, cheese, ranch and red pepper - can make sausage mixture ahead of time and stuff mushrooms when ready to bake. Took these to a party and they were gone in a flash! 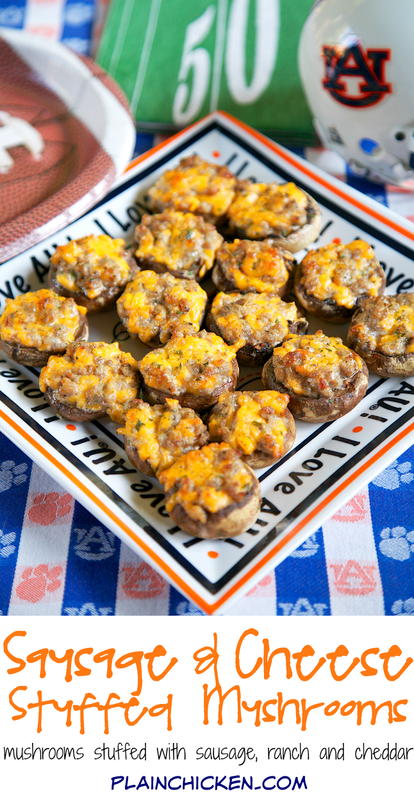 These Sausage and Cheese Stuffed Mushroom were the hit of our tailgate party last weekend. I wasn't sure they would actually make it to the party though. Chicken Legs sampled one, then two, then three - you get the idea. He could have made a meal out of these things! 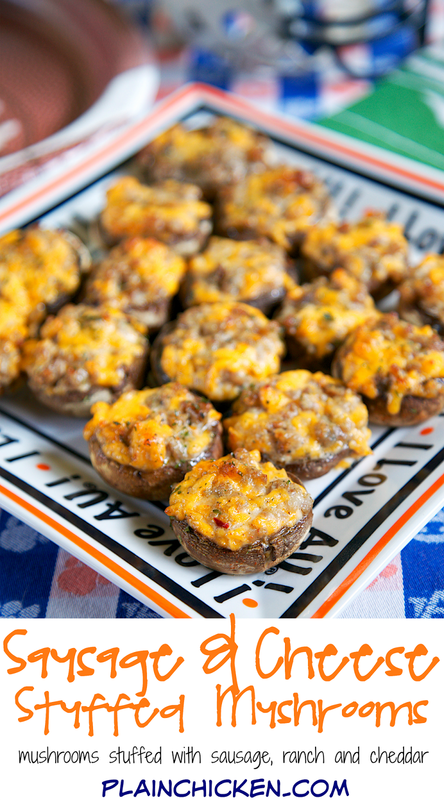 The mushrooms are stuffed with a mixture of cooked sausage, Ranch dressing, cheddar cheese and a dash of red pepper. They are ridiculously good. 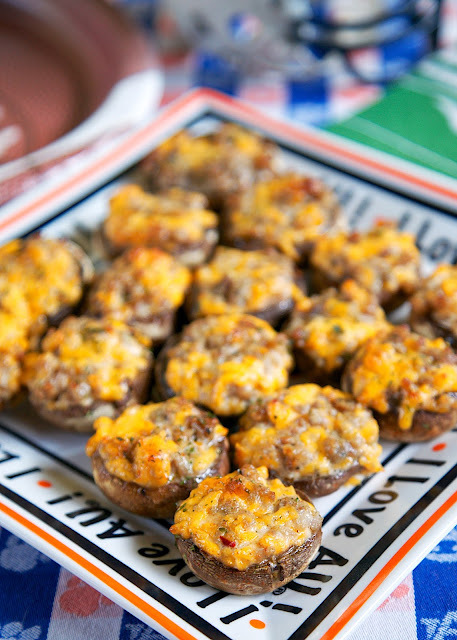 If you are taking these to a party, you can make the sausage mixture ahead of time and refrigerate it until you are ready to stuff and bake the mushrooms. The amount of mushrooms you get will depend on how big your mushroom caps are. I got 18 stuffed mushrooms. Some of my mushrooms caps were pretty big. 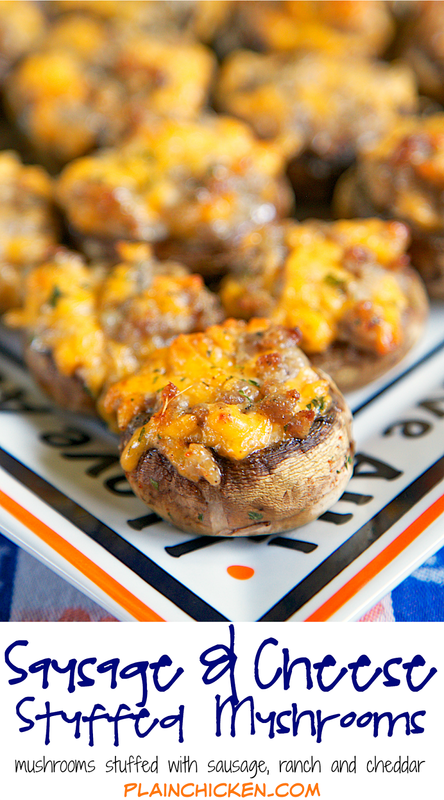 These Sausage and Cheese Stuffed Mushrooms were super easy to make, and clean up was a breeze. I threw all the mushroom stems into the sink and let my new InSinkErator Evolution Excel Garbage Disposal work its magic. It ground up the mushroom stems without any problems. I loved being able to prep and clean up at the same time. I put the bowl and spoon in the dishwasher and the kitchen was cleaned up in a snap! I love easy party cleanup! Remove stems from mushrooms. Wipe mushroom caps off with a damp cloth. Combine the sausage, cheese, Ranch dressing, and red pepper in a large bowl. Fill each mushroom cap with sausage mixture. Bake for 17-20 minutes, until heated through. Mmmm I can see why they almost didn't make it to the tailgating party! I would have a hard time not snitching them too!